Lviv surprised me. At first I didn’t think that this city had so much to offer. Especially not for the two and a half weeks I was about to spend there. I mean, yes, I know it is a beautiful city and that its city centre is on the World Heritage list of Unesco. But I thought two or three days might be enough to see this. And then?! Luckily, I was wrong. Lviv offered me plenty of things to do and see. Today I’d like to tell you about my 12 favorite things to do in this gorgeous city in Ukraine. 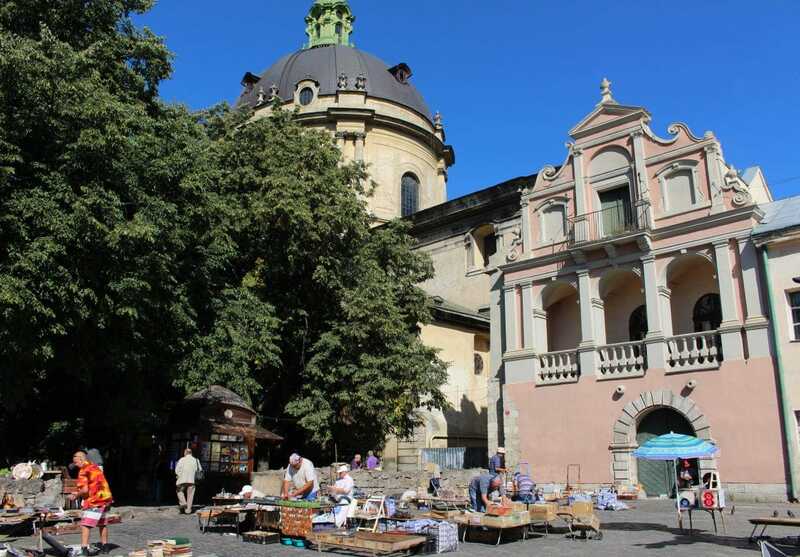 The dynamic centre of Lviv is the Ploshcha Rynok (market square). Dynamic, because there are always things happening. Trams coming in and out of the square, fancy ladies in dresses walking around selling candy out of a basket and street artists performing on every corner. The Ploshcha Rynok is vivid and also very beautiful. The four sides of the square are surrounded by the most colorful houses (44 in total) with each a different facade. Some are yellow with a pointy roof and others are black with a heavy stone patron. Each house is unique. The best way to take it all in is to visit the tower of the city hall. From there you’ll get a panoramic view over the Ploshcha Rynok. Location: Ploshcha Rynok. Entrance fee: 10 UAH. In one of the streets of the Ploshcha Rynok you’ll find the Boim’s Chapel. It’s a very little chapel with a kind of dark and massive look. A signal for what is under the chapel which is the tomb of the seventeenth century Boim family. This chapel is very popular in Lviv and the reason for this is the beautiful interior. 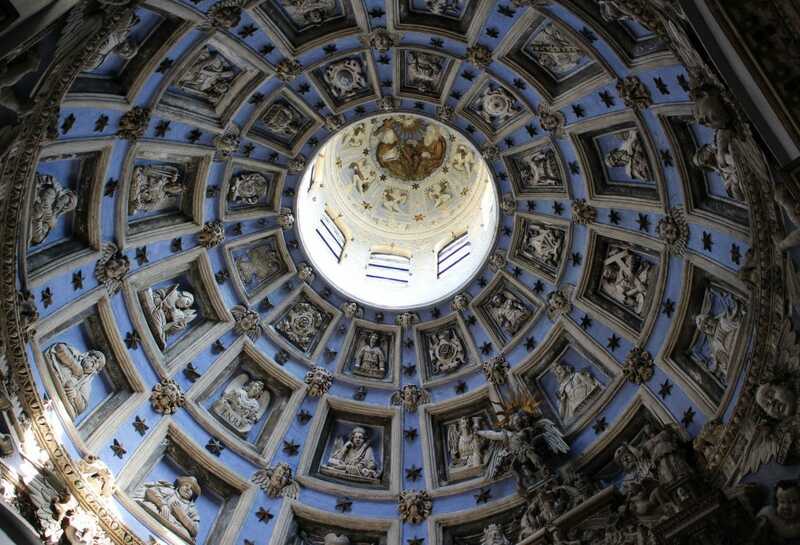 So make sure to visit it when you can and don’t forget to look up to see the amazing dome inside. It’s beautifully decorated with small little angels and saints. Location: Katedral’na square, 1. Only opened in summer between 11.00 and 17.00 hours. Entrance: 10 UAH. 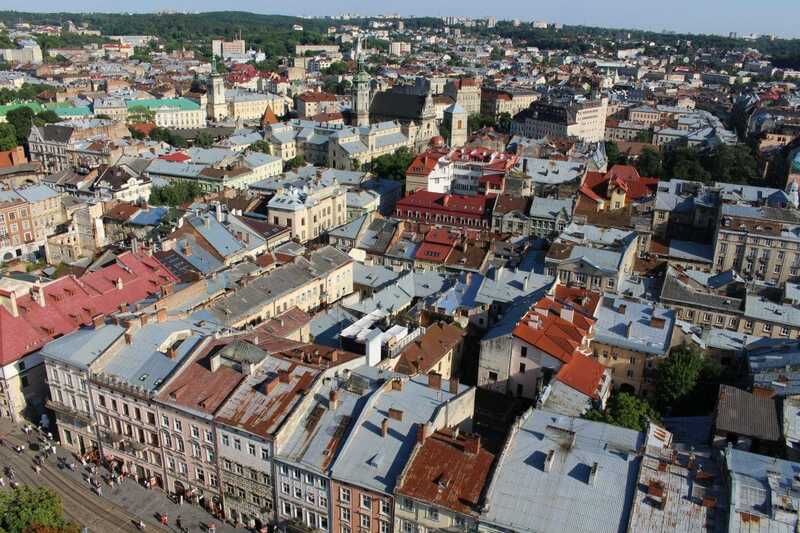 Lviv is an old city and the oldest place is the Virmenska street. 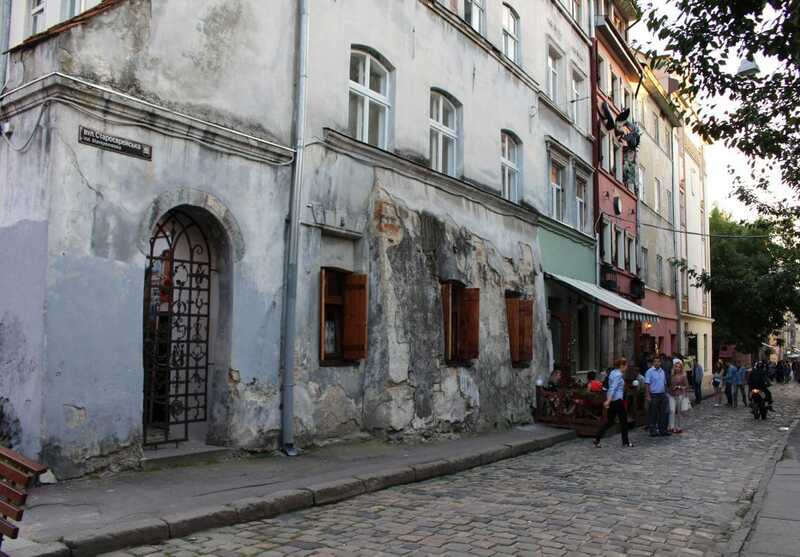 This street is the center of the old Armenian quarter and in my eyes one of the most beautiful streets of Lviv. The torn-down houses and the many details are a true sight for sore eyes. From crooked windows to little statues and paintings, it’s all here. There is just something cool and hip about this street. Take for instance the Dzuga gallery at the end of the street. Here you can visit an art gallery, listen to live music and drink a few lemonades (or beers). 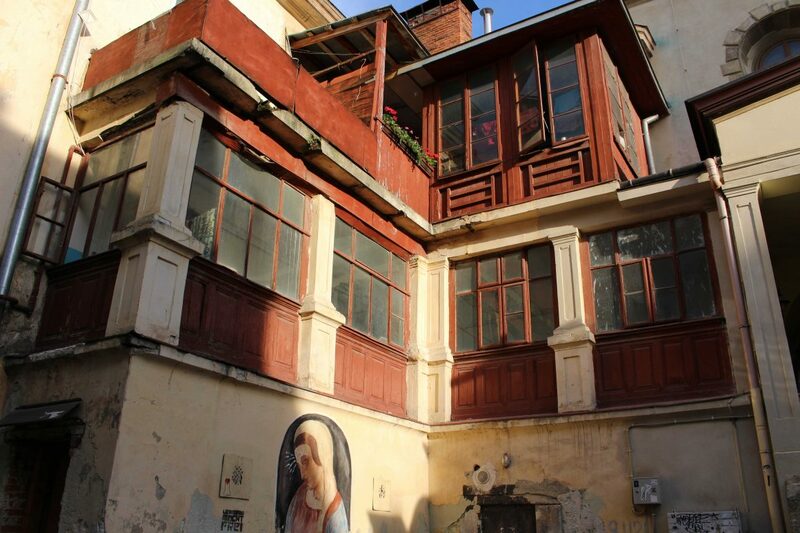 One of my favorite things to do in Lviv is snooping around for courtyards. Many apartment blocks in this city are built in the shape of a square with a little courtyard in the middle. This is the place where people hang out their laundry, chat with each other and let the children play games. 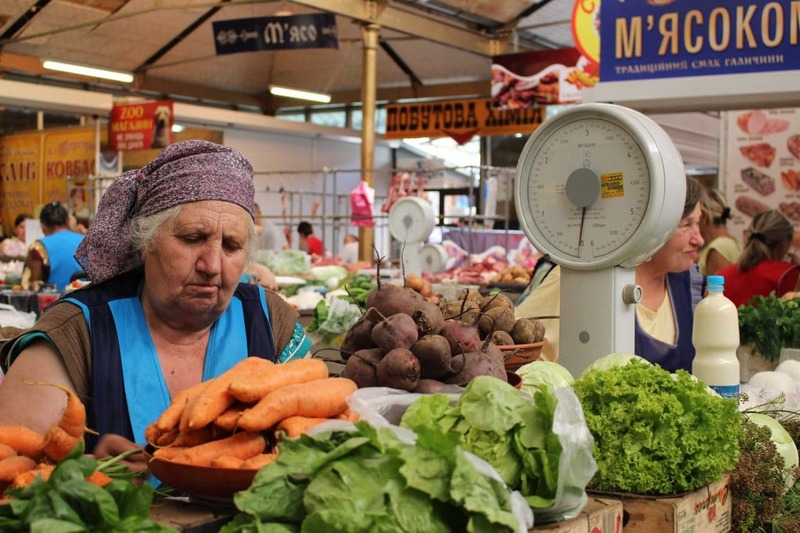 A place of the ordinary lives of the people of Lviv. 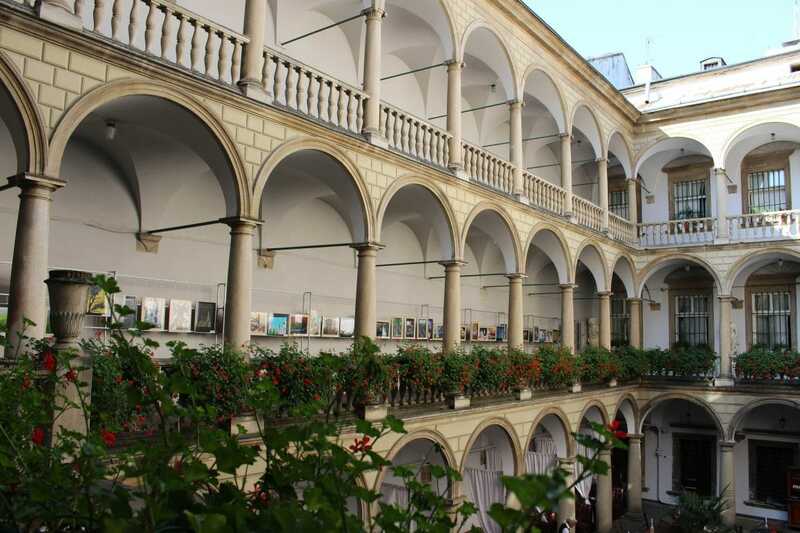 The most well-known courtyard is the Italian courtyard at the Ploshcha Rynok. Beautiful, but a bit too clean for me. I like the more authentic ones I found in the Armenian quarter. Here the courtyards are small, colorful and more alive. 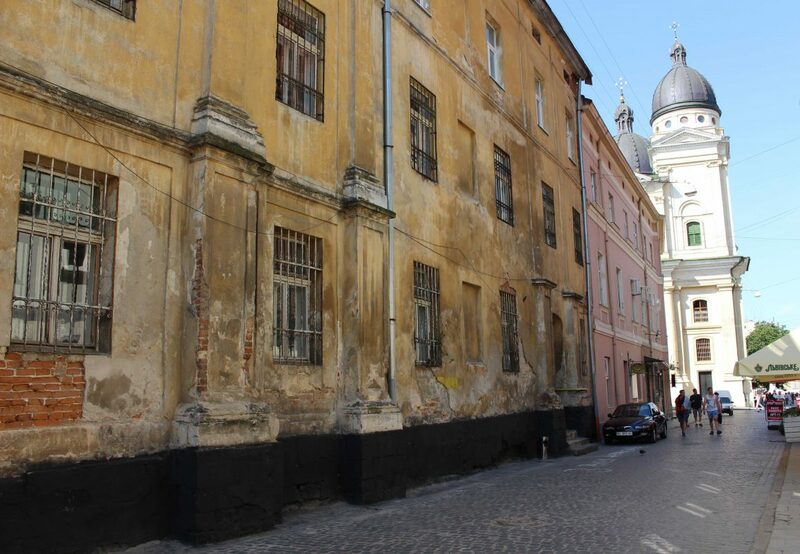 Lviv is a city with a tragic Jewish history. Eighty years ago there were standing over 45 synagogues in this city. 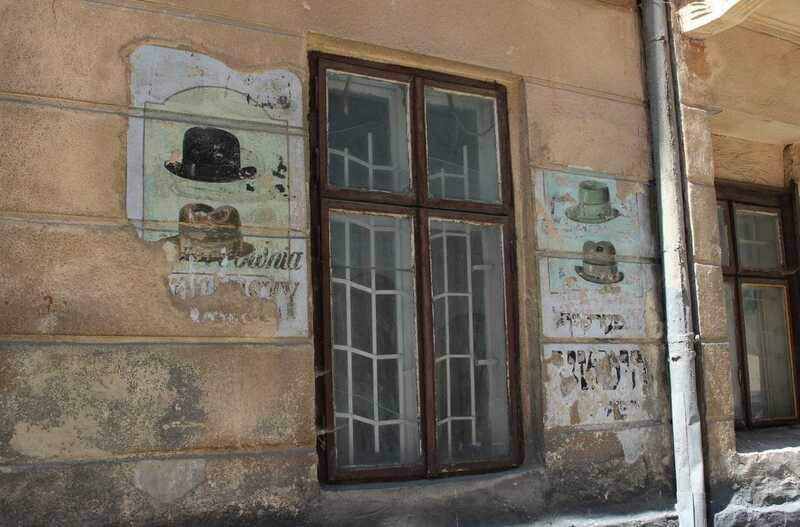 A little under 50 percent of the people of Lviv were Jewish. And today? None. Zero. Nearly all the Jews were taken away during the Second World War. Not only the nazi-Germans were responsible for this, also the people of Lviv themselves. Antisemitism was pretty common back then. One by one the synagogues were blown up. What stayed behind were empty places. Literally holes between two houses. And it stayed that way for years. Some turned into garbage sites, others are little squares or parks. The most well-known site is the place where the Golden Rose synagogue used to stand. 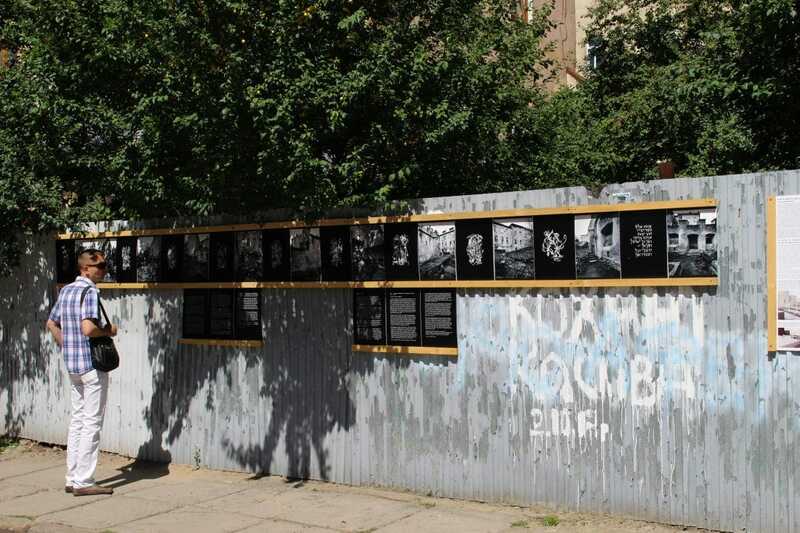 If you visit it now you will see a fence of corrugated iron and since a couple of years there are also a few photos to remind the people of their history. But many Jewish sites are still empty. 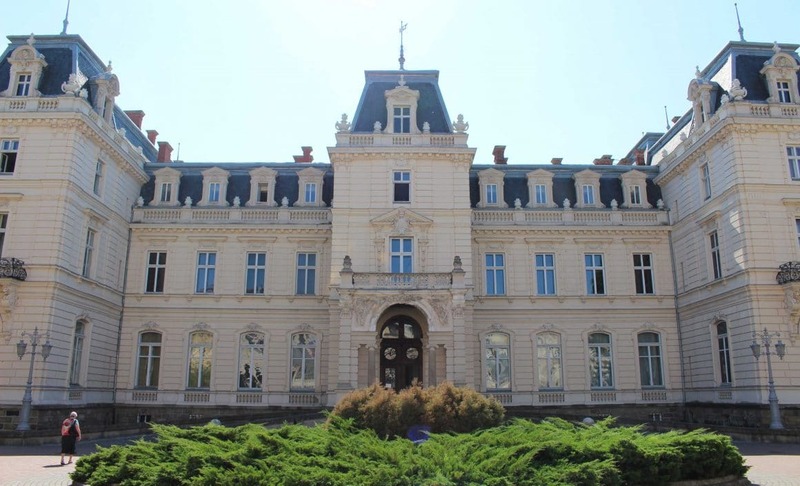 The beautiful Potocki Palace immediately draws your attention when you walk passed it. I know, because I walked passed it every day to get to my volunteer job. On one of my last days in Lviv I finally got a chance to stop and look at it. This palace is built in the nineteenth century as a residence for the Austrian governor Alfred Potocki. The Potocki family was one of the most powerful and richest families in Central Europe in the nineteenth century. Today the palace is a home to the Art Gallery of Lviv with pieces dating back to the fourteenth to the eighteenth century. Like I said in my last post, Lviv is a coffee city. It shouldn’t be hard to find a decent cup of coffee. 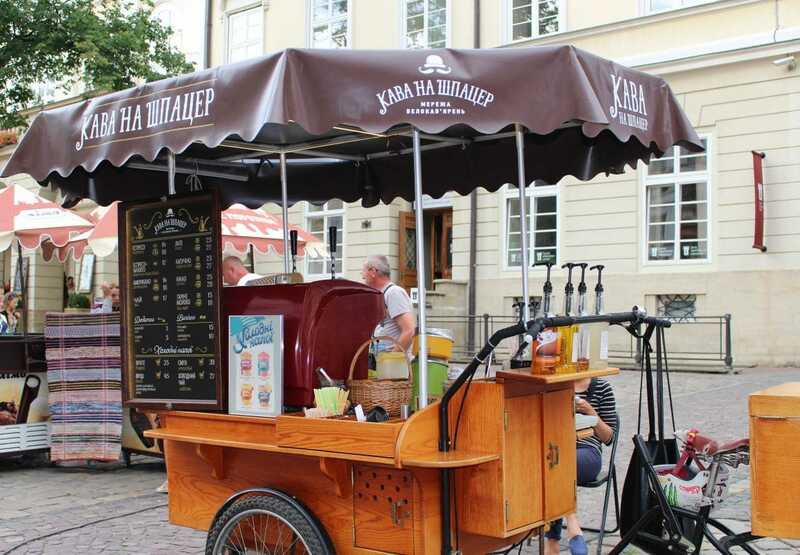 Of course you could visit one of the many cafes, but you could also find coffee at any street corner with a mobile stand. Some are just the back of cars turned into a little cafe. Lviv is the city of churches. Everywhere you go you see churches. The Central European position contributed to this. But they’re not all the same. Every church belongs to a different school, ranging from Greek-catholic, orthodox to Armenian. Most people go to the Greek-catholic church. This church recognises the Pope as their leader, but they follow the Orthodox calendar. This means that Christmas is not celebrated in December, but in January. The oldest church in Lviv is the Armenian Church. The entrance of this church is a bit hidden behind an iron fence, but once you get inside you’ll be amazed by the colorful frescos and icons. During the weekends there’s no escape. You will literally see newlyweds everywhere. Dressed up in their smoking and wedding dress they go into the city and pose in front of every historically significant building. And not just them, friends and family come with them. For me it was always fun to watch, because at a certain point brides were just lining up in front of churches and chapels posing in all sorts of crazy positions. ‘Rynok’ means market and you find them everywhere in the city. Ranging from small ones to big indoor markets. I always like them, because markets are full with colors, movement and people. 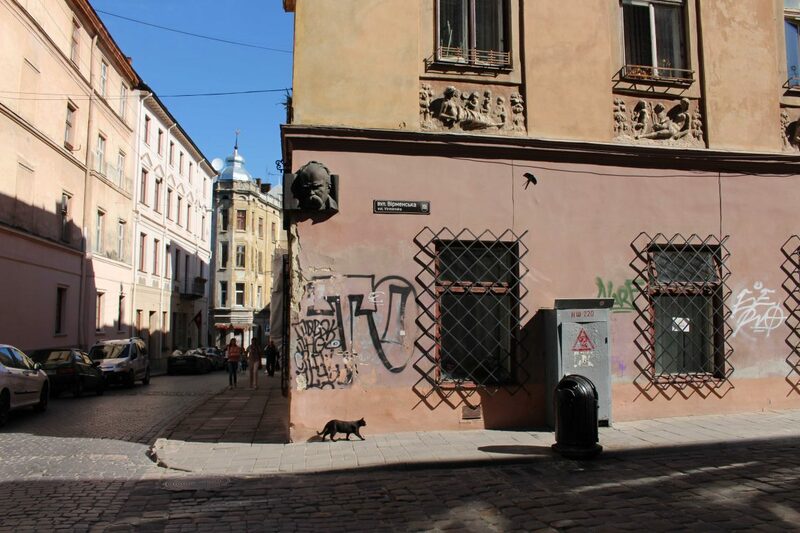 My advice is to visit a rynok in the city center. People there are a bit more used to nosy tourists. I also visited a few markets outside the city center and there I was often asked to put my camera away. The view from city hall is pretty good, but if you want to go even higher then you should visit Castle Hill. 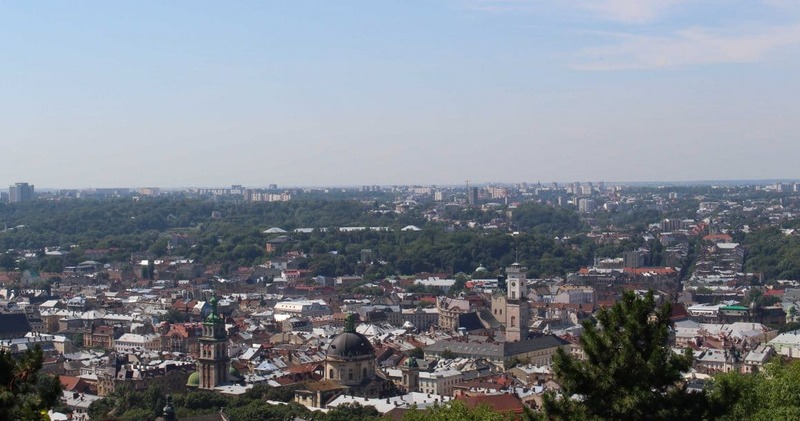 This is the highest point of Lviv. The name itself is a bit misleading, because you won’t find any castle up here. The original castle got destroyed in the eighteenth century by the Swedish army. Today the hill is marked by a huge radio mast. It’s pretty ugly, but at the same time useful as an orientation point in the city. 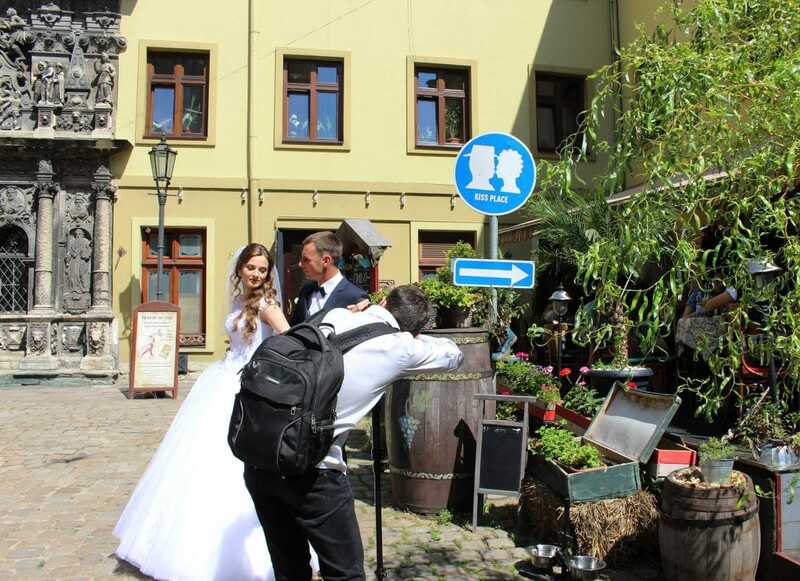 If you’re done with the brides, head over to Svoboda Prospekt to mingle among the people. On the summer weekends everyone gathers here to sit on the benches. On some benches you’ll see young people hugging and kissing each others, on others you’ll see groups of old men playing chess. I really enjoyed watching all these different people coming together while drinking the local drink kvas. 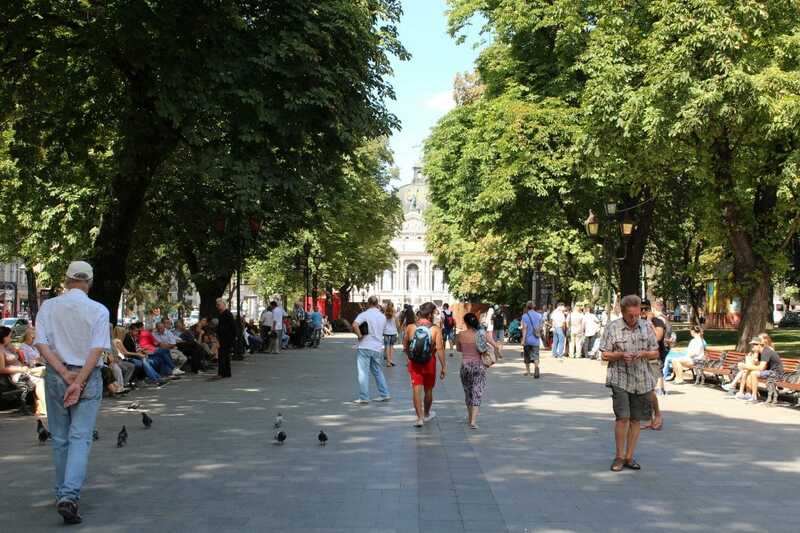 Do you want to know more about Lviv? 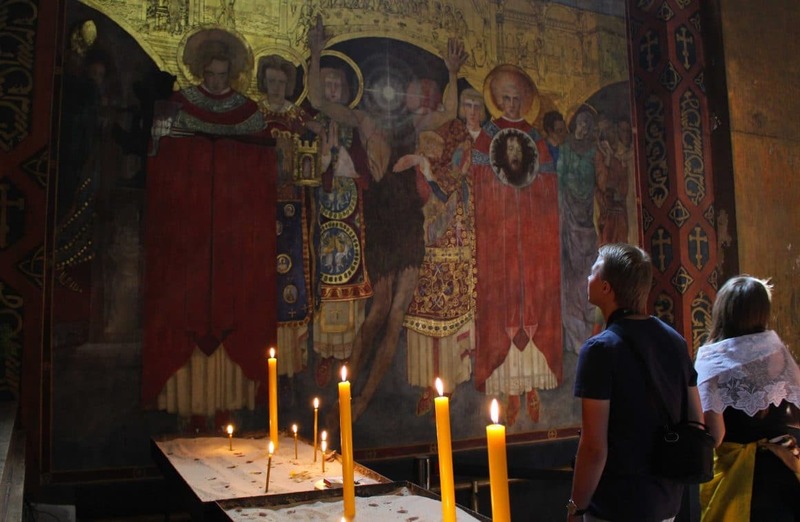 Then you might be interested in my previous post about experiencing Lviv through your senses. 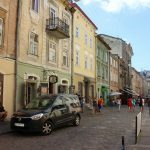 What do you think of Lviv? 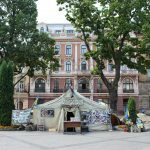 Ukraine: is it safe for travelers?